In the United States, there are 615,899 patients on renal replacement therapy. In France, the prevalence of the ESRD is 1127 cases per million population. In North Africa, the prevalence of ESRD treated by dialysis ranged between 47 and 680 cases per million population. In Morocco, it was estimated at 267.1 to be cases per million population in four regions according to the first annual report of the Magredial register. Patients on hemodialysis (HD) many psychological disturbances due to psychological distress including depression and anxiety,,, with increased symptom load and a poor quality of life (QoL). There are few studies on psychological disorders and QoL have been reported from Morocco. The aim of this study was to assess the prevalence of depressive and anxiety disorders, suicidal ideation, and the QoL among HD patients and their associations with socio-demographic characteristics. This is a cross-sectional study carried out at the Center of hemodialysis of Al Farabi Hospital of Oujda, Morocco, during a period of six months between July and December 2015, among 103 HD patients. All recruited patients were over 18-year-old, who had been on HD for at least one month and who have no known psychiatric disorder. They were all informed by their physicians about the purpose of the study, and they gave their verbal consent. We excluded from the study, all patients with an intellectual disability or do not speak Moroccan dialect or those who have a sensory deficit which prevents them from having the psychiatric interview. For each patient, the data were collected by a psychiatric resident from medical records and dialysis notebook, as well as by an inquiry conducted by nurses and physicians, and also through a confidential personal, 30 min interview which takes place during the dialysis session. The following are the four parts of the survey questionnaire. The first one related to demographic characteristics including age, gender, profession, marital status, socioeconomic level, and education level. To determine the socioeconomic level of the participants, we used the problems meeting basic needs scale which is composed of five items specifying, if in the last 30 days, the participants met serious problems concerning food, transportation, finance, housing, and clothing. The second part was about the clinical and dialytic data for each patient. We determined comorbidities such as diabetes, hypertension, heart disease, glomerular disease, and family history of psychiatric disorders. The third part of the survey concerned the assessment of anxiety and depressive disorders using a semi-structured interview based on the Diagnostic and Statistical Manual of Mental Disorders Fourth Edition (DSM-IV) which is the Mini-International Neuropsychiatric Interview (MINI) translated and validated into Moroccan dialect. It allows identifying a current major depressive episode (MDE), a previous depressive episode, melancholic features, a current panic disorder, agoraphobia, social phobia, generalized anxiety disorder (GAD), suicidal ideations during the last month, and suicide risk. The MINI sensitivity varied between 45% and 96%, specificity of 86%–100%, and the correlation coefficient (kappa) between 0.43 and 0.90. It is particularly good for the diagnosis of depressive disorders, panic disorders, and agoraphobia. The validity study demonstrated a satisfactory quantitative assessment. The data suggest that the Moroccan version of the MINI has managed to raise the validity of the symptoms of criteria used in the DSM-IV diagnoses. The last part included the assessment of the QoL of patients using an interview based on the five dimensions of Morocco of the European Quality of Life-5 Dimensions (EQ-5D) and the Visual Analog Scale (EQ-VAS), translated and validated in Moroccan dialect. This scale is relatively short and therefore more simple and fast to complete, and the information obtained could be converted into a single index. As it is frequently used in patients with ESRD.,, This scale was collected by the investigator. Statistical analysis was performed using Statistical Package for Social Sciences (SPSS) software version 21.0 for Windows (SPSS Inc, Chicago, IL, USA). All variables were summarized using descriptive statistics. Qualitative variables were described in terms of proportions, and the quantitative variables were described in terms of means and standard deviations. Multivariate analysis was conducted by step-down logistic regression. Variables significantly associated to the 20% threshold in the univariate analysis were selected to be introduced into an initial model. P <0.05 was considered statistically significant, and the results have been expressed by the odds ratio and its 95% confidence interval. One hundred and sixteen chronic HD patients were recruited, 13 of them were excluded for these reasons: death in one case, mental retardation in five cases, and deafness in six cases, whereas the last case was a non-Moroccan dialect speaker [Table 1]. Nearly 10.7% of HD patients had a member of the family with a psychiatric disorder. 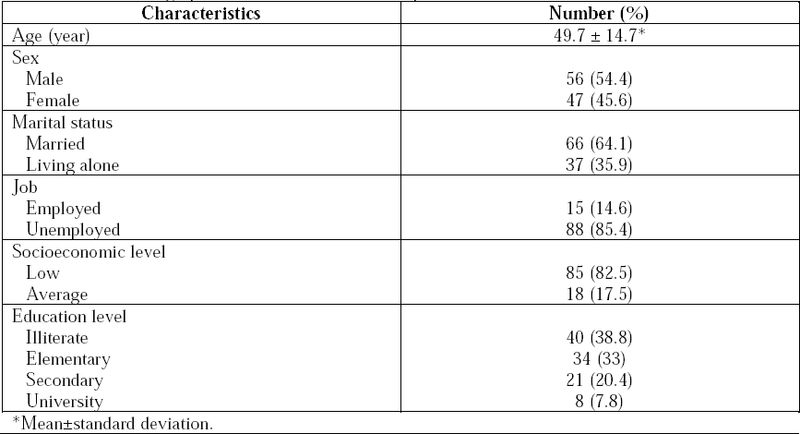 Table 1: Socio-demographic characteristics of the sample. 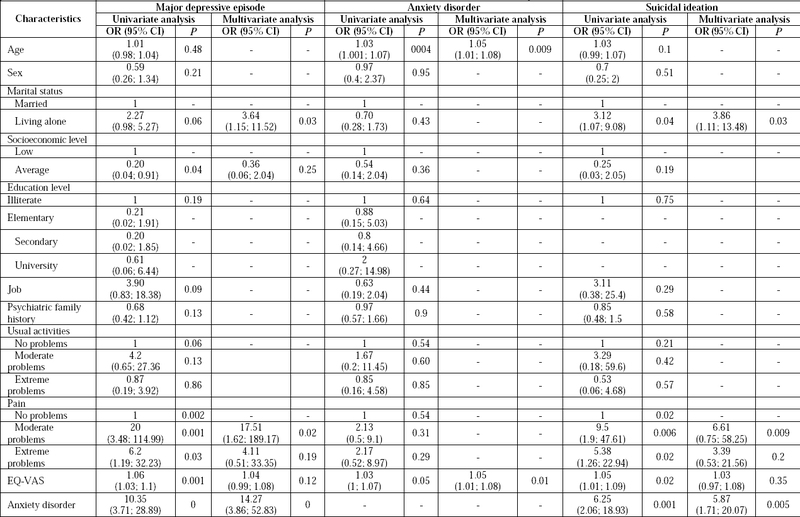 Among 103 participants, 35 patients had a current MDE, of whom 65.7% had melancholic features, whereas 25.7% had a recurrent depressive disorder while the prevalence of anxiety disorders was 26% [Table 2]. Table 2: Prevalence of depressive and anxiety disorders. During the last month before the study, 16.5% of patients had thoughts about suicide, 1.9% planned their suicide, and none attempted suicide. The mean of EQ-5D index value was 0.41 ± 0.36 [Table 3]. Table 3: EQ-5D descriptive system in chronic hemodialysis patients. The median of EQ-5D index value was 0.52 (0.20; 0.68). 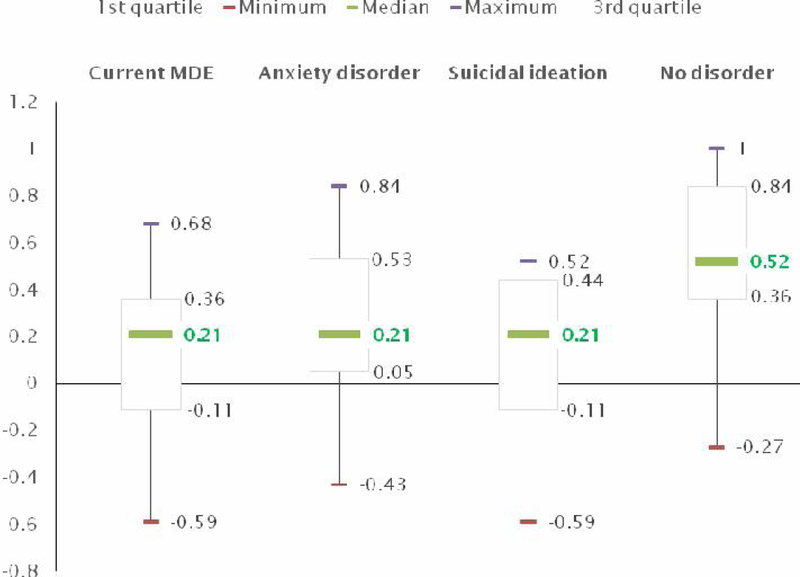 It was lower for patients with current MDE, anxious patients, and in those with suicidal ideation, whereas it was higher in patients with no anxious-depressive disorder [Figure 1]. Figure 1: Median of EQ-5D index. The EQ-VAS score for these patients was 45.73 ± 14. Multivariate analysis showed that the current MDE was associated with three factors: living alone, the presence of pain, and anxiety disorder. Suicidal ideations were correlated with patients living alone and having anxiety disorders. While anxiety disorders were combined with age and pain [Table 4]. Table 4: Associated factors of the current MDE, anxiety disorder, and suicidal ideation: uni- and multi-variate analysis. To the best of our knowledge, this is the first study in Morocco that has studied the psychopathology of depressive and anxiety disorders in chronic HD patients and assessed the suicidal risk in these patients. The prevalence of the current MDE in the general population is about 1.1%–15% among men and 1.8%–23% among women. In our study, these rates were significantly higher in the HD patients (34%), which is similar to the rate reported in a systematic review. However, this rate is distinctly lower than two previous studies, one from Morocco and the other from Tunisia (67% and 46.2%, respectively). It should be noted that both studies used the Hospital Anxiety and Depression Scale to explore depression in HD patients; however, another study using the Beck Depression Inventory and Beck Anxiety Inventory found a lower rate (25.7%). This variation can be explained by the use of different methodologies. A diagnostic interview provides better information about having psychiatric disorders compared to a self-reported questionnaire. Moreover, the assessment of somatic symptoms of depression is particularly difficult in chronic renal failure patients because they can be caused by uremic symptoms. Anxiety disorders were also found to be common (25.2%), social phobia at 9.7%, panic disorder at 7.8%, agoraphobia at 5.8%, and GAD at 18.4%. A similar study using the same scale (MINI) found similar prevalence for social phobia and panic disorder, a higher rate for agoraphobia and a lower rate for the GAD. This difference in rates can be linked to the small sample size of the study referred to. Regarding the suicidal risk, our study showed that suicidal ideations were greater among HD patients, with a rate estimated at 16.5%. This result was also shown a systematic review. In a study from Lebanon carried out among 51 HD patients using the same instrument (MINI) reported a rate of 37%. This difference in rates can be due to the small sample size of the study mentioned. For QoL, the majority of our patients has reported moderate-to-extreme problems in usual activities, mobility, anxiety/depression, and pain/discomfort (76.7% and 71.8%, 66%, and 59.2%, respectively). However, only 31.1% reported the same degree of problems in self-care. This result differs from a study from Malaysia in 654 patients, which showed that the majority of patients reported no problems in terms of the five dimensions of the EQ-5D system. This variation can be explained by ethnic difference, the delay in diagnosis, at delay of treatment, and poor adequacy of dialysis. As regards of EQ-5D index, the mean score was 0.41 ± 0.36 which is similar to that reported by Lee et al, whereas it was lower than those found by Wasserfallen et al, Roderick et al, and Yang et al. The EQ-VAS score among our patients was 45.73 ± 14. This is lower than rates reported from England and Ireland (58.3± 23.9). Many other researchers using different tools reported reduced QoL in HD patients., We have shown that patients with a current MDE had a lower QoL score than the nondepressed patients (P = 0.04). On the other hand, there was no association between anxiety on QoL (P = 0.8). Vazquez et al have previously shown that depression affects the physical components of QoL, whereas the anxiety affects the emotional and social components of QoL which are not assessed by the EQ-5D. Untas et al have demonstrated, using Kidney Disease Quality of Life (KDQoL), that patients with high depressive and/or anxious symptomatology had a low physical and mental QoL, but with a low correlation between physical QoL and anxiety. It should be mentioned that our suicidal patients had a low QoL compared with other patients (P = 0.008). Multivariate analysis in our study has shown that the MDE was associated with three factors living alone, presence of pain, and anxiety disorders. Evans et al and Mingardi also found that married HD patients have a better QoL than those living alone. A previous study from our center showed that depression was more prevalent in patients with pain. Similar results have been reported. Association of depressive disorder to anxiety disorder was described both in our study and in literature data. We also found an association between adulthood and low EQ-VAS score and anxiety disorder. For this age group, we can explain this by the fact that adults are still building their future in fear of death and living thus in painful and permanent psychological suffering. Multivariate analysis has also shown, as in the depression case, that suicidal ideation was associated with living and anxiety disorder. It behooves health-care staff looking after chronic HD patients to remember that they constitute a population at risk of having depressive and anxiety disorders as well as suicidal ideation and that taking care of the HD patients must include psychiatric assessment and treatment if required. Our study confirms the high prevalence of depressive and anxiety disorders and suicidal ideations among chronic HD patients and their association with an altered QoL. Woo KT, Choong HL, Wong KS, Tan HB, Chan CM. The contribution of chronic kidney disease to the global burden of major noncommunicable diseases. Kidney Int 2012;81:1044-5. Professional recommendations and references service. Diagnosis of chronic renal failure in adults: Text of recommendations 2002. Diabetes Metab 2003;29:315-24. Collins AJ, Foley RN, Chavers B, et al. US renal data system 2013 annual data report. Am J Kidney Dis 2014;63 1 Suppl:A7. Lassalle M, Ayav C, Frimat L, Jacquelinet C, Couchoud C; Au Nom du Registre REIN. The essential of 2012 results from the French renal epidemiology and information network (REIN) ESRD registry. Nephrol Ther 2015;11:78-87. Benghanem Gharbi M. Renal replacement therapies for end-stage renal disease in North Africa. Clin Nephrol 2010;74 Suppl 1:S17-9. Boly A, El Hassane Trabelsi M, Ramdani B, 0et al. Estimate of the needs in renal transplantation in Morocco. Nephrol Ther 2014;10:512-7. Nasr M, Hadj Ammar M, Khammouma S, Ben Dhia N, Ghachem A. Haemodialysis and its impact on the quality of life. Nephrol Ther 2008;4:21-7. Turkistani I, Nuqali A, Badawi M, et al. The prevalence of anxiety and depression among end-stage renal disease patients on hemodialysis in Saudi Arabia. Ren Fail 2014;36:1510-5. Feroze U, Martin D, Reina-Patton A, Kalantar-Zadeh K, Kopple JD. Mental health, depression, and anxiety in patients on maintenance dialysis. Iran J Kidney Dis 2010;4:173-80. Stein MB, Cox BJ, Afifi TO, Belik SL, Sareen J. Does co-morbid depressive illness magnify the impact of chronic physical illness? A population-based perspective. Psychol Med 2006;36:587-96. Lowney AC, Myles HT, Bristowe K, et al. Understanding what influences the healthrelated quality of life of hemodialysis patients: A collaborative study in England and Ireland. J Pain Symptom Manage 2015;50:778-85. Kadri N, Agoub M, El Gnaoui S, Alami KhM, Hergueta T, Moussaoui D. Moroccan colloquial Arabic version of the mini international neuropsychiatric interview (MINI): qualitative and quantitative validation. Eur Psychiatry 2005;20:193-5. Weissman MM, Bland RC, Canino GJ, et al. Cross-national epidemiology of major depression and bipolar disorder. JAMA 1996; 276:293-9. Khoudri I, Belayachi J, Dendane T, et al. Measuring quality of life after intensive care using the Arabic version for Morocco of the EuroQol 5 Dimensions. BMC Res Notes 2012;5:56. Lee AJ, Morgan CL, Conway P, Currie CJ. Characterisation and comparison of health-related quality of life for patients with renal failure. Curr Med Res Opin 2005;21:1777-83. Manns B, Johnson JA, Taub K, Mortis G, Ghali WA, Donaldson C. Quality of life in patients treated with hemodialysis or peritoneal dialysis: what are the important determinants? Clin Nephrol 2003;60:341-51. Manns BJ, Johnson JA, Taub K, Mortis G, Ghali WA, Donaldson C. Dialysis adequacy and health related quality of life in hemodialysis patients. ASAIO J 1992 2002;48: 565-9. Pompili M, Venturini P, Montebovi F, et al. Suicide risk in dialysis: review of current literature. Int J Psychiatry Med 2013;46:85-108. Anxiety, depressive disorders and Quality of life in hemodialysis. Available: http:// www.sciencedirect.com/science/article/pii/S1769725505000040. [Last accessed on 2016 Jan 26]. Zouari L, Elleuch M, Feki I, et al. Depression in chronic hemodialysis patients: report of 106 cases. Tunis Med 2011;89:157-62. Stasiak CE, Bazan KS, Kuss RS, Schuinski AF, Baroni G. Prevalence of anxiety and depression and its comorbidities in patients with chronic kidney disease on hemodialysis and peritoneal dialysis. J Bras Nefrol 2014; 36:325-31. Untas A, Chauveau P. Toward a better evaluation of psychosocial aspects in nephrology. Nephrol Ther 2008;4:228-30. Martiny C, de Oliveira e Silva AC, Neto JP, Nardi AE. Factors associated with risk of suicide in patients with hemodialysis. Compr Psychiatry 2011;52:465-8. Macaron G, Fahed M, Matar D, et al. Anxiety, depression and suicidal ideation in Lebanese patients undergoing hemodialysis. Community Ment Health J 2014;50:235-8. Faridah A, Jamaiyah H, Goh A, Soraya A. The validation of the EQ-5D in Malaysian dialysis patients. Med J Malaysia 2010;65 Suppl A:114-9. Wasserfallen JB, Halabi G, Saudan P, Perneger T, Feldman HI, Martin PY, Wauters JP. Quality of life on chronic dialysis: comparison between haemodialysis and peritoneal dialysis. Nephrol Dial Transplant. 2004 Jun;19(6):1594-9. Roderick P, Armitage A, Nicholson T, Mehta R, Gerard K, Mullee M et al. Evaluation of Hemodialysis in Renal Satellite Units in England and Wales. Am J Kidney Dis. 2004 Jul;44(1):121-31. Jin-Bor Chen, Ben-Chung Cheng, Cheng-Hong Yang,and Moi-Sin Hua. An association between time-varying serum albumin level and the mortality rate in maintenance haemodialysis patients: a five-year clinical cohort study. BMC Nephrol. 2016; 17: 117. Fukuhara S, Lopes AA, Bragg-Gresham JL, et al. Health-related quality of life among dialysis patients on three continents: the dialysis outcomes and practice patterns study. Kidney Int 2003;64:1903-10. Kimmel PL, Peterson RA, Weihs KL, et al. Psychosocial factors, behavioral compliance and survival in urban hemodialysis patients. Kidney Int 1998;54:245-54. Vázquez I, Valderrábano F, Fort J, Jofré R, López-Gómez JM, Moreno F, et al. Psychosocial factors and health-related quality of life in hemodialysis patients. Qual Life Res Int J Qual Life Asp Treat Care Rehabil 2005;14:179-90. Untas A, Aguirrezabal M, Chauveau P, Leguen E, Combe C, Rascle N. Anxiety and depression in hemodialysis: validation of the hospital anxiety and depression scale (HADS). Nephrol Ther 2009;5:193-200. Evans RW, Manninen DL, Garrison LP Jr., et al. The quality of life of patients with end-stage renal disease. N Engl J Med 1985;312:553-9. Mingardi G. From the development to the clinical application of a questionnaire on the quality of life in dialysis. The experience of the Italian collaborative DIA-QOL (dialysis-quality of life) group. Nephrol Dial Transplant Off Publ Eur Dial Transpl Assoc Eur Ren Assoc 1998;13:70-5. El Harraqui R, Abda N, Bentata Y, Haddiya I. Evaluation and analysis of pain in chronic hemodialysis. Nephrol Ther 2014;10:500-6. Kroenke K, Spitzer RL, Williams JB, et al. Physical symptoms in primary care. Predictors of psychiatric disorders and functional impairment. Arch Fam Med 1994;3:774-9.